Frank Walker, with military precision Frank gets fast results. 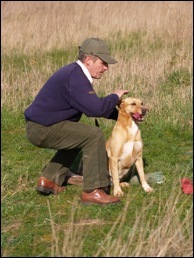 Specialist in training you to train your dog. Get rewarding results in simple easy to follow staged lessons. Available in one to one sessions or in small groups. Residential training for your dog is also available. We only accept a maximum of 6 dogs at any one time, this ensures each and every one receives the maximum of attention to bring out their full potential. Located in Langenhoe, near Colchester and with over 30 years experience you can be sure your dogs will receive the very best of care.